Writer’s Roundtable: What one offseason move would you like your favorite team to make? The Padres need a shortstop. That much is painfully obvious. After a year of trudging along with an abysmal combination of Alexi Amarista and Clint Barmes, the Padres can’t ignore their need anymore. Trading for shortstop prospect Javier Guerra was a good start, but the Padres need a more immediate option at shortstop for next season. This is where Javier Baez comes in. It is clear the Cubs are open to trading the shortstop/2nd baseman, given the fact that the Cubs have both Starlin Castro and Addison Russell up the middle. While Castro appears to be the more likely trade candidate, the Cubs may be able to get more in return for Baez given his age, inexpensive cost, and high potential upside. Baez is just the kind of player the Padres need at shortstop. Baez plays above average defense and has a lot of power potential for a shortstop. The Padres need as much offensive help as they can get and Baez has the potential upside to be a fantastic offensive player long-term. The potential for this deal makes even more sense given the fact that the Padres have exactly what the Cubs want; young starting pitching. The Padres have made it clear that Tyson Ross is available in trade, and he is just the type of pitcher the Cubs need going forward. The Cubs and Padres needs and areas of strength align perfectly to make this kind of deal happen. This is the deal I want as a Padres fan this offseason. The stretch of White Sox third basemen since Joe Crede is a who’s who of mediocrity. This has been the biggest hole in their lineup for closing in on a decade and there still seems to be not a single person in the organization that will be filling that spot. Enter Todd Frazier. It’s a fairly well-known strategy that the corner infielders should have a power upside. The White Sox have ignored that notion and have gone mostly for defense, if nothing else (see Gordon Beckham). Frazier isn’t a gold glove candidate but he isn’t a butcher either. 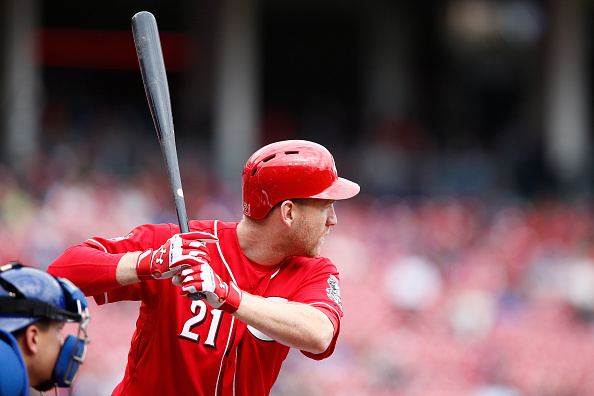 The defensive downgrade, despite the rest of the team’s issues, can be accepted for someone with Frazier’s bat. It’s well known that the White Sox have a plethora of starting pitching and the Reds have been searching high and low for seemingly all five of the spots on their starting rotation. The trade I’d offer would be centered around Erik Johnson, Frankie Montas or possibly even both. Johnson was the 2015 International League MVP and filled in the back-end of the rotation admirably in September. Montas was also called up in September and the White Sox still insist he’s a starter even though he may have a closer’s repertoire. With the Reds possibly shipping Chapman out-of-town, Montas could be his heir. The White Sox have the pieces that the Reds need and Frazier is my golden goose of the offseason. If they could get a Jay Bruce throw-in, I wouldn’t hate it. The obvious choice is for the Colorado Rockies to trade Carlos Gonzalez – which the organization should do and continue the rebuild – but that’s not the most important thing this offseason; it’s what they shouldn’t do. Let’s face it, the Rockies aren’t going to compete in 2016. Trading superstar shortstop Troy Tulowitzki this past summer confirmed that. However, there is a ton of talent expected to break into the major leagues over the next two years and the one thing the Rockies cannot do is overpay veterans to multi-year contracts and block the prospects that will make them relevant again.The Rockies have holes all over the field; Shortstop Jose Reyes underperformed and might be facing discipline from MLB after an alleged domestic abuse incident in Hawaii, first base was manned by Ben Paulsen, a replacement level hitter with little power and backup catcher is still a question. That’s not including the potential trade of Gonzalez, which would open a gaping hole in right field and deprive the lineup of a second power bat. I haven’t even touched the pitching yet, which is generally atrocious, but you see my point; the Rockies have some spots to fill.Luckily, there’s a good amount of talent waiting for a chance to prove themselves. Shortstop Trevor Story (MLB.com’s 11th Organizational Prospect) deserves a shot at the starting job after slashing .279/.350/.514 in AA and AAA. Catcher Tommy Murphy (12) got a taste of the majors during a September call-up. David Dahl (3), the 2011 first round pick, is a speedy outfielder who played well in AA after bruising and removing his spleen midseason.Pitchers Jeff Hoffman (4), Kyle Freeland (9), Antonio Senzatela (13) and Carlos Estevez are all high-upside prospects that will reach the big leagues either in 2016 or 2017 (Senzatela). That’s without mentioning the guys who debuted in 2015; 2012 first round pick Jon Gray (2) and 20-year-old Miguel Castro (10) finished the season with the Rockies and will presumably start 2016 with the club. Rockies GM Jeff Bridich is entering his second year as Rockies GM and has so far displayed more competence than the Rockies front office has shown over the four years before his promotion. Still, there’s a wariness when it comes to free agency; this is still the team that gave an injured Boone Logan a three-year, 16 million dollar contract two years ago. Bridich gave Kyle Kendrick a one-year, 5.5 million dollar contract last offseason. Kendrick was awful, but his contract wasn’t. It gave the Rockies flexibility; if Kendrick pitched well, they could trade him midseason for prospects or sign an extension. If he was bad, he’s gone after the season. If the Rockies sign anyone other than a top-tier free agent (looking at you, Chris Davis), it better be a one-year contract. Trust the development process. Let the young guys play. The Red Sox clearly will add a high-priced free agent this winter. Hiring Dave Dombrowski, who has given out large contracts to Justin Verlander, Anibal Sanchez, Prince Fielder, Miguel Cabrera and Victor Martinez clearly foreshadowed this. It will likely be a top-of-the-rotation pitcher to anchor this rotation. It will probably be David Price. That’s great, but the Red Sox primary objective should be trying to perform damage limitations on the catastrophe that was last offseason. Trading for Wade Miley turned into a fringe success, yet the free agents, Justin Masterson, Hanley Ramirez and Pablo Sandoval were a collective mess. Masterson has gone, now comes the time to coax a GM into taking one, if not both of the remaining duo off the Red Sox hands. Rumors circulated that the Red Sox are open to eating half of the Ramirez contract to a willing team, offering savings in the region of $33M whilst Sandoval is still on the hook for 4 more years and over $72M, a number darkening the cloud over Ben Cherington’s reign as General Manager.To find a suitor for either would allow the Red Sox to plug the other into the DH role from 2017 onwards, it would clear room for in the lineup for a young player, and it would most importantly save the Red Sox some money that at this current juncture is being monumentally wasted. Seeing Sandoval swing at a ball in the dirt 3-0 or Ramirez trying to make any pitch a home run becomes increasingly frustrating, as did the paltry OPS+ numbers at 76 and 90 respectively. For the Red Sox, whilst Price is nice, addition by subtraction is desirable. As a Mariners fan there are many areas that need strengthening. I suppose that is true for all teams, as you can seemingly never have enough starting pitching depth for example. I doubt very much the team will go for another mega contract free agent, like they did two years ago with Robinson Cano but you never know. The biggest chasm, as it has been for years, is in the outfield where all manner of dreadful defenders have found themselves these past seasons. Jerry Dipoto has already traded for a defence-first centerfielder in Leonys Martyn. I would like the M’s to go for another well above average defender in Alex Gordon. Gordon did not have his best year for the Royals, individually, slipping to the bottom third of the order in an injury hit year. Perhaps this might mean he comes at a slight discount in free agency. He’ll be 32 entering next season, but two of the last four years he has posted a WAR of above 6. I think he’s a cheaper, but older, version of Jason Heyward and well worth pursuing. I can write paragraphs upon paragraphs on how badly I would love the Cubs to blow an exorbitant amount of money on a long-term deal for Jason Heyward, or how I believe Charlie Blackmon would be an excellent leadoff man in the lineup for years to come. Fact is, the Cubs offense is already very good; Anthony Rizzo and Kris Bryant is as good a one-two punch as any in the league, and surrounding them with the likes of Kyle Schwarber, Jorge Soler and Addison Russell already provide a daunting task for any pitcher in the league. The Cubs need to fill a hole that plagued them for the entire 2015 regular season: they need a legitimate third starter in the rotation. Jake Arrieta and Jon Lester delivered tremendous 2015 seasons as the Cubs’ one-two punch at the top of the rotation. Arrieta had one of those rare seasons where you just knew the Cubs were going to pull out a win when he took the mound, and while a regression almost seems natural at this point, the Cubs still have an ace in him for several years to come. And Jon Lester proved to be worth every penny of that large contract with a very efficient first season in Chicago. Kyle Hendricks and Jason Hammel cycled the #3 spot in the rotation, and both men were wildly inconsistent throughout the year. Hendricks looks to be the real deal; he’s the only pitcher I’ve seen draw legitimate comparisons to Greg Maddux in his methodical approach, and he showed flashes of brilliance in his final three starts of the year. Hammel had a terrific first half of 2015 before falling apart; he posted a 5.10 ERA in 67 second-half innings, and will humorously be remembered by this writer as his mother’s most hated pitcher for his second half struggles. Neither pitcher, however, is the guy you want to turn to when you’re down 2-0 in the NLCS, as the Cubs learned by relying on both in Games 3 and 4 against the Mets, and losing both. They’re good pitchers, and Hendricks could evolve into one of those guys, but he’s not there yet. This was the Cubs’ biggest problem in the 2015 postseason, and they need to fix it with urgency. So who should fill this role? Theo Epstein and Jed Hoyer have met with Jeff Samardzija and John Lackey recently, neither of whom are guys I would like to see in Cubbie Blue next year. I couldn’t stand Samardzija in his first run with the Cubs and thought he was grossly overrated, while I think Lackey largely benefitted from The Cardinal Way that always seems to morph average pitchers into stellar ones. Yes, Lackey has a terrific postseason pedigree, but his age (37) and likely desire for a long-term deal is a commitment I’m not fond of. Good pitching comes at a cost, and pitchers like Wei-Yin Chen, Scott Kazmir and Mike Leake may very well be worth the investment at the right price. Sure, none of them have significant October experience, but they’re good pitchers who would consistently help Arrieta and Lester feel less pressure at the top. Doug Fister and Tim Lincecum have Chris Bosio restoration success written all over them, but they would have to come much lower than they might demand due to regression and injury concerns. Who do you want your favorite team to acquire/sign this offseason? Let us know in the comments section below. Let us know which player you want your favorite team to acquire or sign on Twitter @CTBMLB or on our Facebook page. You can find links to all our writers work and how to contact them on our writers page.